Well I’m on day three now, but i’ll post in order. The first couple of days I didn’t have anything to do except write and sleep, so I took lots of notes. Feel free to skip over anything as I know this is long. But maybe it will be hepful to other people. 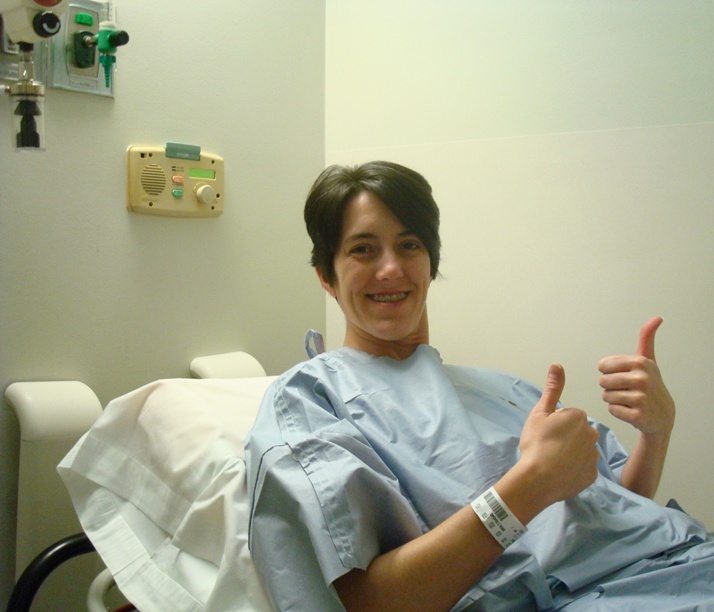 Here I am just after 7am, ready to prep for surgery. Got taken back after 8:30 and I don’t remember much after that, just the lights being arranged over my head. Apparently I had a conversation with the surgeon but I don’t remember any of it. Surgery is estimated at 3 1/2 to 4 12/ hours. The surgeon has told me they have been working long and hard on my models and worked it all out. He thinks i may want a genioplasty at some point but I find this hard to imagine. Due to insurance reasons they can’t do together with this surgery. I just can’t imagine going through this again for something totally optional. I wake up in recovery where it has been several hours since surgery already. Lots of people in there. I am so sleepy I let myself doze for quite a while,propping and eye open once in a while to see what is happening. Apparently beds are hard to get so I am waiting quite a bit longer. I am so sleepy I don’t care that there are people everywhere and a blood cuff is squeezing my arm at intervals. I am in pain and very dry, and at some point manage to indicate to a nurse. They give me pain meds which help, but they seem to have taken forever to get them. The nurse asks me a question and I grunt. I find I’m not able to make any words. She says your jaws may be wired shut, but you can still talk! I think no I can’t! It must be the swelling. I am numb on the tip of my tounge and my upper jaw and end of my nose. The finally find me a room but it’s a while longer til I get there. My husband has been waiting in it for a while when I arrive. I find it hard to stay awake for any length of time, but I try. People are remarking on how alert I am and how little swelling i have. Really? I feel like a chipmunk. Even the surgeon says so when I see him. He is very pleased with how everything has turned out. Surgery was 3 1/2 hours. The CR says I have perfect cuts on my jaw bones. 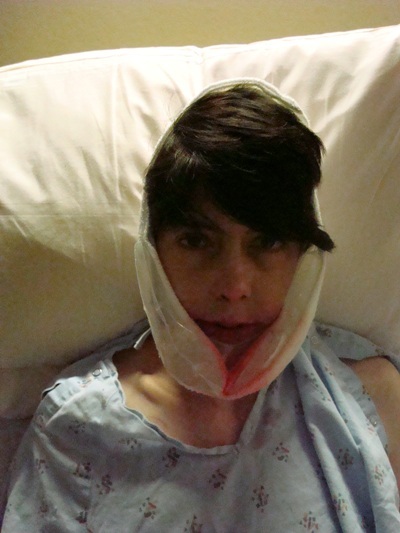 Dr. explained again how the lower jaw is just laying besides itself and not glued together with anything. It will just grow back together. Then the bad news, he wants me to be bound for four weeks instead of three, because of my age and to make sure the bones do right. Oh dear. They have moved the upper jaw forward 5 mm and the lower one back 4 mm and changed the plane of it so it would look better. I doze off and on that evening. David leaves sometime, nurses come in and take vitals, otherwise they leave me alone. The nurses were all super nice and helpful. As I cannot talk, it is so great that I brought a pen and paper with me. Indespensible.That and chapstick & a mirror were all I really needed. I can grunt and make funny noises but nobody but the surgeon can understand me. He’s used to it, he says. Very funny, I guess he would be. They are giving me morphine over a self-controlled drip, which is great. They also give me more of the steroid to counteract swelling. When I got ready to move out of recovery, I got pretty nauseous and they hurried up and gave me something for that. I got nauseous three more time that evening, all bringing up pure blood, and one time was pretty bad convulsions. I did okay with it, just leaned over and let it come up. Blood on an empty tummy can do that to you. Dr. said they try to pump my stomach out at end of surgery, but can’t get it all. I don’t have to go the bathroom until 11:40pm. I call and a male nurse comes in (great) and I’m flapping in the back. It’s a little awkward but I manage. On my first time out of bed, I’m happy I can walk ok, just a little unsteady. When I move around or lean forward, my nose bleeds. It drips and spatters all over. It’s stuffed full of blood. Sometimes it just drained while laying there. So the jaw bra with ice that I was wearing got to looking pretty bad. When I asked my husband to take my Day 1 picture, he said it would not make anyone else want to have it done. So in full disclosure I will be posting the good bad and ugly on here. Again it’s all red from my nosebleeds. I didn’t eat anything the first day. Too sleepy. The effects of anesthesia do begin wearing off little by little.